· Clarity grading is open to a great deal of interpretation. What one grading lab considers as a VS 2 might be called a Si 1 by a stricter grading laboratory. We only sell diamonds graded by either AGS or GIA as they are Non-Profit, Independent Grading laboratories. We find their grading is accurate, consistent, and strict. Our opinion on Clarity & what the majority of our customers have found. For the customer who wants the absolute finest quality possible no matter what. Although they know that they may see Zero difference between a VVS 1 and a Si 2 to the naked eye, they need to know deep down that they have given their loved ones the most exceptionally pure diamond possible. Many of the customers in this range have seen other Non-GIA or Non-AGS graded diamonds riddled with inclusions that were presented as Si 1 or Si 2. The term ‘small inclusion’ does not sit well and they generally want to move up into the VS range to make sure that they are secure with the inclusions in the diamond and never have to think twice about them. For larger sized diamonds over 2.50ct, VS Clarity is a more preferable option. Depending on the size of diamond, this clarity range can offer great value. Going into the Si range of diamonds allows customers to increase the size of the diamond without compromising the visible quality of the diamond. With diamonds are over 1 carat, the relative size of the inclusions in a Si 2 Clarity grade diamond can start to become visible so we find that the best value is for stones of Si 1 Clarity Grade with Si 2 being a borderline area. For stones under .75ct Si 1 & Si 2 Clarity is definitely good value. Sometimes one factor has more of an impact on the clarity grade than the others. But the relative importance of each factor varies from one diamond to the next. As an example, one inclusion off to the side of a stone would have less impact on clarity than the same inclusion(s) located directly under the table. In this instance the position is probably the determining factor. Size has a lot to do with how easy it is to see a clarity characteristic. Generally, the larger and more visible a clarity characteristic is, the lower the diamond's clarity grade will be. In addition to affe3ctiing the grade, large inclusions might also threaten a diamond's durability. In a diamond with inclusions of different sizes, one or two of the larger inclusions usually establish the grade if there are also smaller inclusions, they seldom affect the clarity grade. More clarity characteristics can mean a lower grade, but grades are normally set by how readily you can see the characteristics, not by counting them. For example, a diamond with a number of minute, pinpoints can still qualify as VVS. On the other hand a single large, dark, or centrally located included crystal could drop the grade into VS, SI, or even I Clarity. 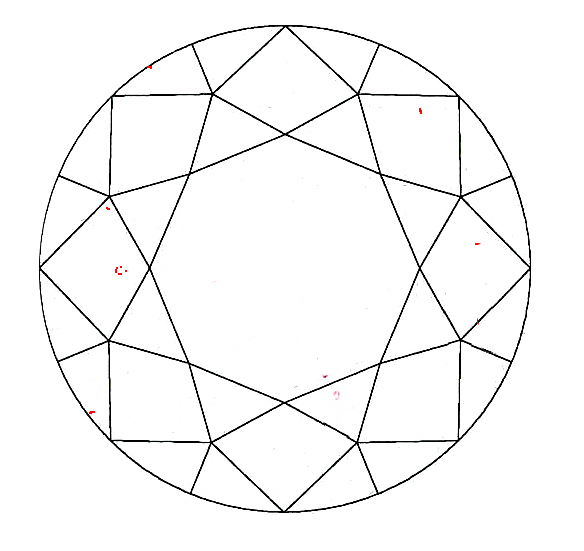 Inclusions are most visible when they're directly under the table. Inclusions under the crown facets or near the girdle are usually more difficult to see-that's why you have to examine the stone from several angles to find all of its characteristics. The worst location for an inclusion is where it becomes a reflector. If it lies under the table and near the pavilion, the pavilion facets can act as mirrors and reflect multiple images of the inclusion. This can have a major effect on the grade if the reflections are visible in the face up position. The position of potentially damaging inclusions, such as feathers, large knots, and included crystals can also be significant. For example, a feather might get bigger. Normally, feathers won't grow during ordinary wear, and the mounting protects those that reach the pavilion, but feathers that extend to the girdle or crown-the exposed parts of the stone-might grow if the diamond strikes something hard enough. A central location increases an inclusions impact on a diamond's clarity grade. Inclusions located directly under the table affect the clarity grade of a diamond more than those located on the backside of the stone or under the facets. The nature, or type, of a clarity characteristic tells you whether it's an inclusion or a blemish and if it poses any risk to the stone. Most characteristics don't. Generally, if a stone has durability problems, it doesn't survive the friction and pressure of the cutting process. The effect of an inclusion on durability is determined by its size and location. For example, a large feather that reaches the crown poses a durability risk, but a small one probably doesn't. NOTE: if an inclusion has the potential to cause damage to a stone, it CAN affect the grade, but this is RARE, and usually applies only to included diamonds. According to GIA, the grader probably would NOT lower the grade of a stone on this basis alone. Color or relief can affect the visibility of a characteristic as much as its size does. Generally, the more an inclusion differs in color from its host, the more obvious it is. Relief is the contrast between the inclusion and the stone. The greater the relief, the more it will affect the clarity grade. Although, most diamond inclusions are white or colorless, some are black, brown, dark red, or on the rare occasion, Green. Since colored inclusions are easier to see, they might lower the grade more than a colorless inclusion. A black pinpoint might be an exception-it's often more difficult to see than a white one. 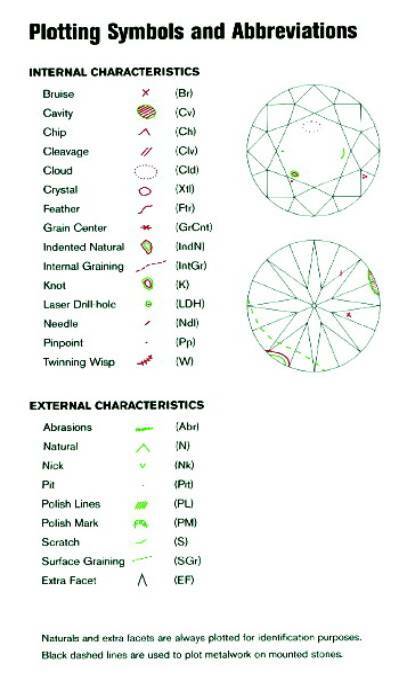 Below is GIA's Guide to different types of inclusions and how they might appear on a diamond's grading certificate. A brief description of the inclusions is below.